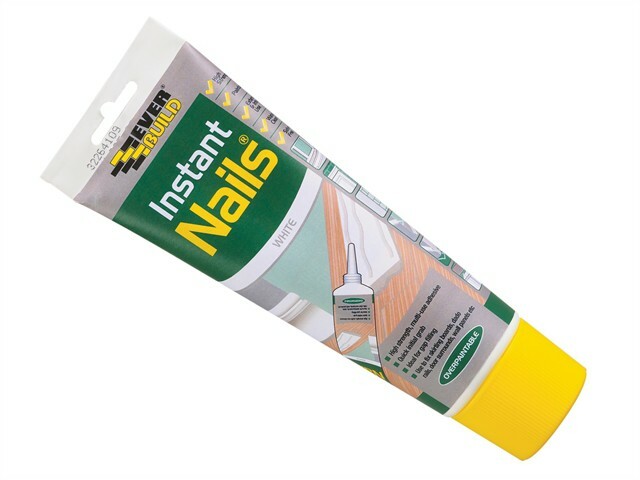 Everbuild Instant Nails is a high strength, solvent-free, gap filling adhesive that provides a quick grab and replaces mechanical fixings in a multitude of home improvement applications, both internally and externally. The product has exceptionally quick drying properties for a solvent free adhesive achieving over 50% of its ultimate bond strength in one hour. Instant Nails dries white and may be overpainted when dry. - Sticking wood, metal, PVC, most plastics, glass, aluminium, concrete, render, stone, paper, cork, ceramics, plaster/plasterboard, rockwool, Pufoam board, Styrofoam, breezeblock etc. - Securing aluminium or other skin panels to the framework or portable industrial buildings and caravans.